Coming down the island chain from the Bahamas, we’d consistently heard how wonderful the island of Bequia is from many boaters. Frannie, a good friend back home said this was one of her favourite places to sail in the world. So there was quite a bit of build up and anticipation to our arrival. And we weren’t disappointed. As part of the protocol of arriving in a new country, we visited the Customs and Immigration office in our first port of call, Port Elizabeth, shortly after we anchored. 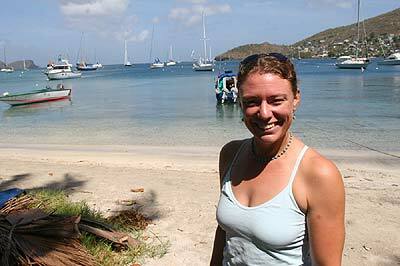 To our surprise, the first phrase the Customs official said to us was “Welcome to Bequia. I know you’re going to like it here”. What a delightful start to our visit and from that moment on, our visit to Bequia just kept getting better. We could feel an ease and relaxed atmosphere as we wandered around town getting the lay of the land with locals greeting us warmly. A question David’s been asking since we left the Bahamas, “Where’s the best place to buy roti (similar to a curry wrap)?” brought many responses. As with anything, everyone has their fave spots and Port Elizabeth was no exception. Several places were pointed out to us and while walking around, we noticed small roadside stalls and counters all selling roti at lunch hour. Up to this point, we’d sampled several coming down the island chain. So we have a theory about the best tasting roti: the closer we get to Trinidad (where the roti is considered by some to be the national dish) the better they taste. However, there is a bit of a rivalry for that distinction between Trinidad and Barbados. Barbadians reckon they make the best roti. And from the sampling we did of a local Barbadian chef Nigel at the “the Salty Dog” in Port Elizabeth, the Barbadian roti appears to be as close to perfection as one can get. However, we’ll reserve final judgement on that matter upon arrival in Trinidad. Bookstores and the people who run them have a special magic about them. No matter where you travel, they are always a wonderful place to spend endless hours of time. It wasn’t until we walked through the wide open doors of The Bequia Bookstore that we realized it’s been an uncommon experience in the Islands to find such a place. But here we found that nugget. This little Caribbean store was celebrating and supporting both local and regional authors with books of poetry, novels, cookbooks and children’s picture books and folktales – all with Caribbean and African themes. And behind the counter, a woman with a sparkle in her eyes and a smile that could light up a room welcomed you. Her name was Cheryl Johnson, also known as Miss Johnson or more affectionately as Rasta Woman, because of her dreadlocks. Cheryl made an immediate connection with us, as she’s lived and traveled abroad. She welcomed us with open arms and an open heart to her store, her family and her community. Not long after we met, we were Cheryl’s guests in Kingstown for a typical weekend back home in Saint Vincent. It started with an evening of high society at the crowning of the Miss Carnival Queen competition (Carnival is in July here). The next day, we wandered the fields and tasted exotic fruits on Rasta Bones’ Organic farm, toured the Botanical Gardens, stopped to say hello to old neighbourhood friends, and then we sat down to a traditional Sunday feast served up by Cheryl’s daughter, Lafayette. The conversation never stopped. We got insight into the Caribbean culture from someone who is passionate and active in her community. Cheryl was the community connection we’d been looking for through all these months of traveling. Mrs. Joanna Stowe, a High School Science Teacher, telling me about making community benches outside the Bequia Community High School. Within a few minutes of describing our floating classroom project to Cheryl, she helped us connect with a number of local people who were active in the community. First, we met Mrs. Joanna Stowe, a High School Science Teacher and currently the Co-ordinator of the UNESCO Sandwatch program (http://www.sandwatch.org) at the Bequia Community High School. Mrs. Stowe detailed a number of the activities both staff and students have been implementing with Sandwatch throughout the island of Bequia and elsewhere. Since the early 1990’s, the students have been monitoring all the beaches around Bequia and on other islands in the Grenadines. The students collect data and develop first hand knowledge of the state of their beaches. They are actively participating in UNESCO’s Small Island Voices, an online forum where students from small islands around the world discuss relevant and common environmental issues. Students and teachers together have been tackling the garbage problem on the island with regular local clean-ups and have implemented a unique glass recycling program. Following the collection of glass bottles, students smash and crush the glass, then mix it with cement to make park benches for use in the community. A simple, yet effective way to recycle glass with little expense and positive results. The school’s most recent initiative is bringing local Community Radio to their island. A local community radio station is being set up in the High School that will enable students to do community broadcasts and bring attention to environmental and social issues directly to Bequia. You can find out a little more detail about these are outstanding examples of Kids taking direct community action in the January issue of Sandwatch Newswatch (www.unesco.org/csi/smis/siv/Caribbean/svgact-sandw-Beguianewsletter.pdf). Mrs. Stowe pointed out she does not act alone in this work and she’s taken over from a former colleague in all these initiatives – retired teacher and currently, local politician, Mr. Herman Belmar. Mr. Belmar has been an Environmental Educator and Science Teacher for more than 25 years starting with the education of his own children. And he’s taken his passion into the classroom and now back to the community. He’s one of those people who’s been instrumental in not only launching the UNESCO Sandwatch program in Bequia, but together with the support of a team of teachers and students from the High School, he has brought UNESCO’s beach monitoring program to a number of islands in the Caribbean and to other countries. In addition to everything else he does, Mr. Belmar is also a representative on the International Whaling Commission (IWC) who recently held their annual meeting in the Caribbean island of St. Kitts. Why would SVG need a representative on the IWC? Interestingly, the small island of Bequia is the only island in the Caribbean legally entitled to hunt whales. They are allowed to hunt 4 whales per year. And as Mr. Belmar tells us, they rarely catch more than one. Meet Mr. Belmar in our upcoming interview. From our tour of the High School, we indirectly met up with a young Canadian woman completing her Masters in Geography from McGill University in Bequia. Meet Lindsay Copland and find out about her work in an upcoming interview. Through oral recollections by local Fishermen, Lindsay is compiling stories about the state of Coral Reefs in the region. This is a unique alternative to relying solely on the collection of scientific data in determining the state of the local coral reef ecosystem. Lindsay explained to us that people who have grown up on the reef and know it intimately also see changes in its ecosystem. They, too, have theories about the changes they see even though they are not “scientists”. This was a good reminder of the value and importance of observation in understanding our world. Just as the Customs official promised, yes, we do like it in Bequia. It is a Caribbean treasure. And the richness of our experiences come from the people we meet locally. We feel incredibly lucky to uncover these local treasures.